ADAA hosts a panel discussion of the most effective social media platforms for art galleries to grow their audiences and promote artists and artworks. Photo by Varvara Mikushkina. Courtesy of Ronald Feldman Fine Arts, New York. 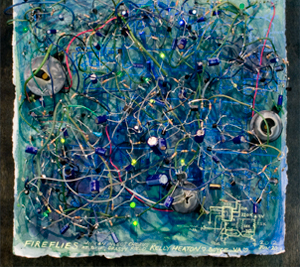 Kelly Heaton, Fireflies (with an Insect Chorus at Dusk, Grassy Field), 2012, electronics and gouache on paper. Account Executive, Social Media, FITZ & CO.